Adelaide Diwali Festival 2018 – SA chapter of Hindu Council of Australia has been celebrating Deepavali since 2015 in association Indian, Nepalese, Bhutanese, Bangladeshi, Tibetan & Fijian communities with great zeal & commitment. The fair is a full day of multicultural stage performances, dance, music and competitions, kids and youth activities, food stalls, art and cultural exhibitions, open dance floor. Spend your day with your family and friends and get engage in colorful and delightful festival event. Rangoli making and many other Competition. 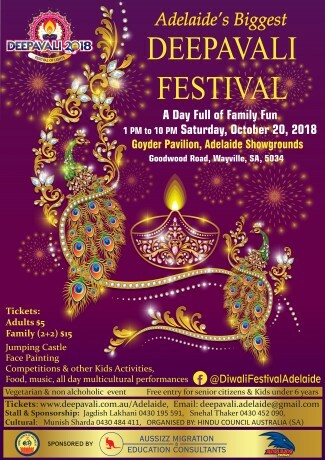 Premier Tickets Australia is proud to be the online ticketing partner for Adelaide Diwali Festival 2018 at Goyder Pavilion on Sunday October 28, 2018 from 12:00 to 5:00 PM.